We’d love your help. 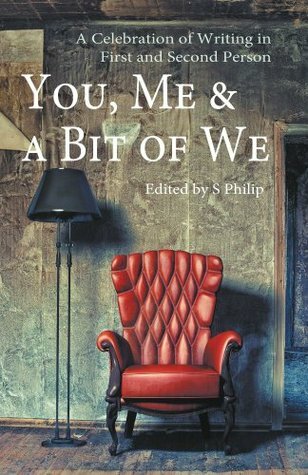 Let us know what’s wrong with this preview of You, Me & a Bit of We by S. Philip. 'You, Me & a Bit of We' is a showcase of 42 stories written in either second, first or first person plural point-of-view. Through a selection of flash fiction and short stories, readers are invited to discover their favourite seat in a story. Is it front row centre, in the midst of a crowd, or from a more personal vantage point? Where second person thrusts the reader i 'You, Me & a Bit of We' is a showcase of 42 stories written in either second, first or first person plural point-of-view. Through a selection of flash fiction and short stories, readers are invited to discover their favourite seat in a story. Is it front row centre, in the midst of a crowd, or from a more personal vantage point? Where second person thrusts the reader into an active role, first person offers experience through the eyes of an individual or group. Although the use of first person is common, second and first person plural perspectives are relatively rare. Written by an international cast of authors, this collection includes a broad range of themes. There are tales of transition, conviction, lost love, grief, conflict, domestic strife, tragedy, second chances, and stories about letting go and moving on. There are worlds where it is rare to be sighted, skin tells a story, past lives haunt, deadly viruses and parasites threaten humanity, and death is personified. From the poignant to the fantastical, dark, witty and uplifting, each story in this anthology is original, thought provoking, and reflective of the versatility of perspective as a literary device. To ask other readers questions about You, Me & a Bit of We, please sign up. Some of these short stories were gripping. The "we" stories were a bit weird but one about rocks worked well. Impossible to be objective when the collection features one of my own short stories, but I'm pleased as punch to be associated with such a diverse array of talented writers.